Because of the steepness of this trail it gets much less use as an access trail into Desolation Wilderness, but it is a nifty shortcut into the Lake of the Wood area rather than using the congested Pacific Crest Trail in from Echo Lakes. You can take a side hike to Ralston Peak, visit a beautiful little meadow, and see the majestic Pyramid Peak from another perspective. Directions: Drive about 44 miles east of Placerville on Highway 50 and watch for Camp Sacramento on the right side of the road. There’s a parking lot across from Camp Sacramento near the unmarked road to the Chapel of Our Lady of the Sierras. The trailhead begins on the Left, just before you reach the chapel. The trail is a good climb through gorgeous old forest with Red Fir, White Fir, Mt. Hemlock and Huckleberry Oak gracing the hillsides. Enjoy the open forest as you slowly climb amongst disintegrating granite becoming rockier and rockier as you gain elevation. 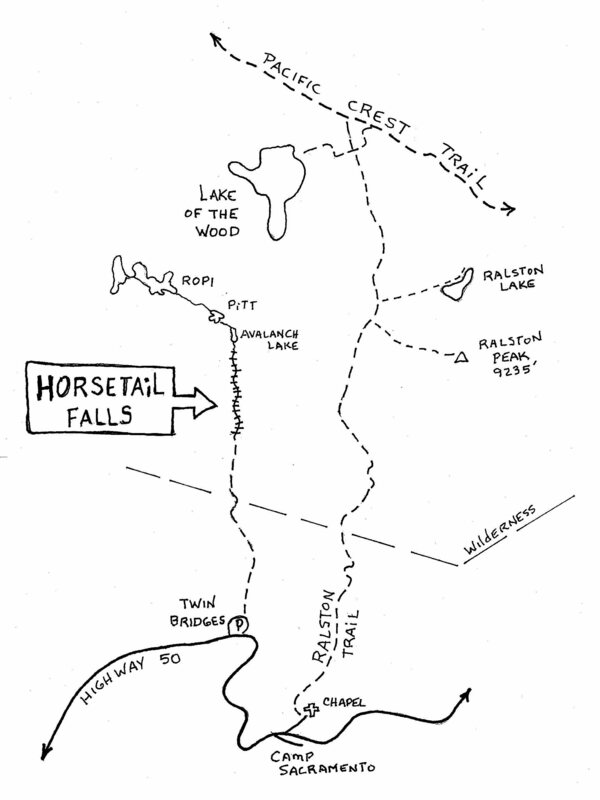 A small side trail along the left will take you to a nice view of Horsetail Falls to the west. You pass the Wilderness Boundary sign and continue up to finally level out at a cute little meadow and spring. The modern way goes around the wet meadow and a trail to Ralston Peak is soon noticed along the right side. Continue straight ahead if your goal is Lake of the Wood. Permits required for Wilderness travel. The short side trip to Ralston Peak is well worth the effort for the views all around. Across the canyon is the Lover’s Leap granite wall, very popular with rock climbers. History: This trail was once accessed from the Pinecrest Church Camp a little further along Highway 50 past Camp Sac. The small meadow once had a goat herder log cabin still standing in the 1950’s. Now only a few sawed timbers can be found. It was common in 1860’s to 1960’s to graze livestock in this area.